Amphenol Socapex has launched the latest member of its high-speed connector family, a Cat.6A, 10 Gb/s Ethernet solution packed into a MIL-DTL-38999 Series III derived shell: The TVµCom-10Gb+. The µCom series is a new range of Ethernet connectors designed to meet the requirements of the latest military industry trends: miniaturisation, high-speed and robustness for use in harsh environments. It is the latest version derived from this series, and it combines the 10 Gb/s Ethernet speed of the classic µCom-10Gb+ with the ruggedness of the 38999 Series III shell. In fact, TVµCom-10Gb+ exceeds 10Gb/s according to the IEEE 802.3an-2006, 10GBase-T standard, and the 38999 series III size 11 shell provides environmental resistance similar to MIL-DTL-38999 Series III. A reduced flange version is also available for jam nut receptacles to minimise the panel footprint. 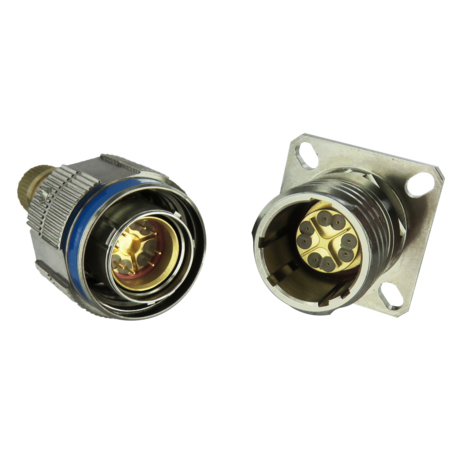 This Ethernet Cat.6A connector is ideal for applications such as high definition and high speed video, uncompressed real-time video (over IP), 10 Gb/s Ethernet switches, vision systems for armoured vehicles, and high-speed mobile terminals like for satellite reception stations and radios.